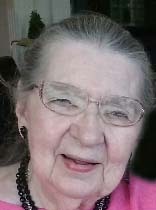 Betty J. Magnuson, 92, of Washington passed away at 10:50 p.m., Saturday, March 23, 2019 at Apostolic Christian Home in Eureka with her family by her side. She was born on April 12, 1926 in Chicago the daughter of Sigmond and Marcella McEvilla Kafkee. She married Jack Magnuson on November 21, 1948 in Peoria. Surviving are her children, John (Grace) Magnuson of Yankton, SD; Anita (Majed) Banjak of Menasha, WI; Marca (Ted) Lott of Washington and Paul (Meschelle) Magnuson of Fulton, MO. Also surviving are 18 grandchildren and 14 great grandchildren along with one half-sister Bonnie Spamer of Gardena, CA. one son Doug Magnuson preceded her in death. Relatively well known to Central Illinois art aficionados, Betty brought an impressive background of study, talent and creative capabilities. A 1944 graduate of Woodruff High school in Peoria, Betty spent most of her life in Illinois working in photography, graphic design and fine arts, She identified herself as a “student of the arts”. She studied extensively throughout the Midwest at the university level and through workshops. This included studies at the Chicago Art Institute, Bradley University, Illinois Central College and Watkins in Nashville. Additionally, Betty studied privately with a number of noted professionals including the late Ed Nicholson. Betty built a successful career in commissioned portraiture using oils and pastels. She worked extensively in the graphic design segment of the field, and had done courtroom sketching for television news broadcast. Betty volunteered for Lakeview Museum and the Elderhostel program and often exhibited her works at local shows and fairs. Later in life, she enjoyed knitting and often knitted blankets and hats for St. Jude Children’s Hospital and taught knitting at the Apostolic Christian Home in Eureka. Cremation has been accorded. A memorial service will be 11:00 a.m., Friday, March 29, 2019 at Mason-White Funeral Home in Washington. Pastor Daniel Bennett from Bethany Community Church will officiate. Visitation will be thirty minutes prior to her service. In lieu of flowers, memorials in her name may be given to St. Jude Children’s Research Hospital. To share a memory or send a condolence for her family, visit www.masonfuneralhomes.com.